Every October, Berks County Eats celebrates National Pizza Month with four weeks of blogging about some of the best pizza shops around. Every year, I pencil in Pizza Time for a blog. And every year, we haven’t made it for one reason or another. 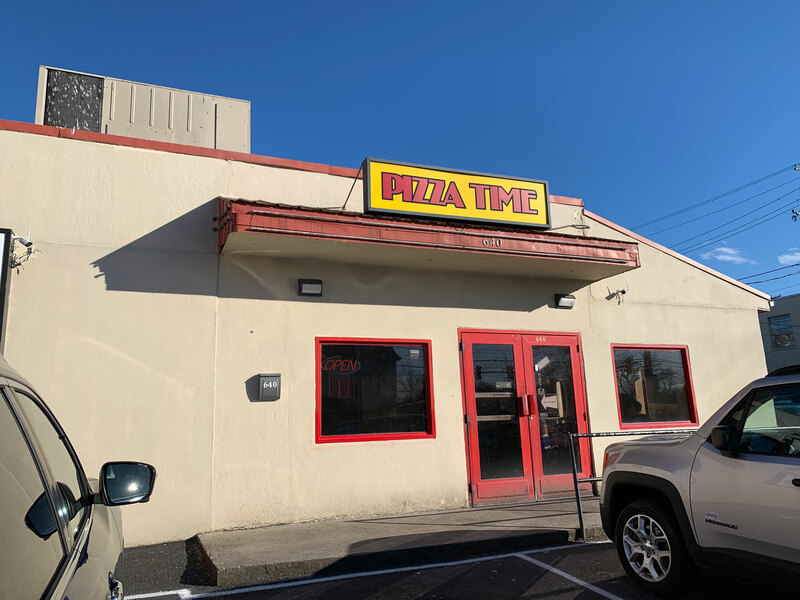 I am old enough to remember when Pizza Time had a location in Wernersville (now the site of CC’s Pizza). It was one of several pizza shops in my family’s rotation while I was growing up in western Berks County. That was 20 years ago. 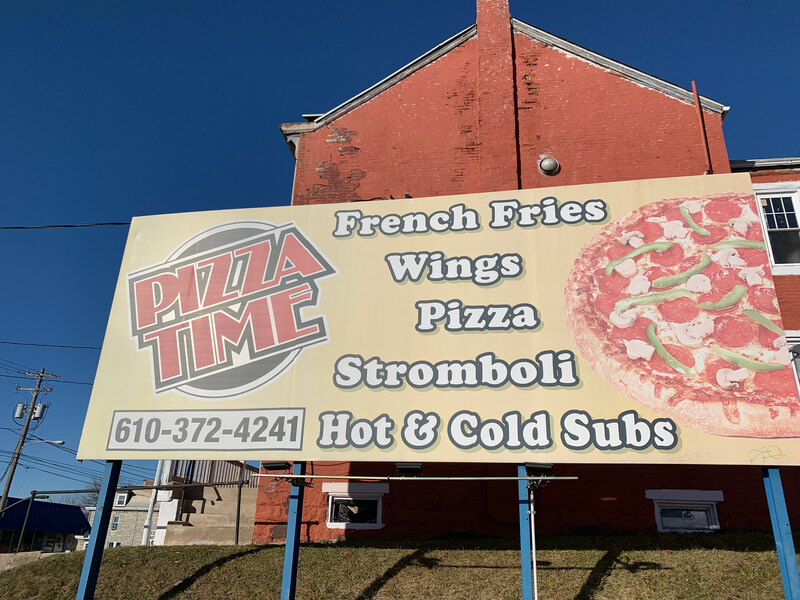 Most of those who know Pizza Time probably know the Lancaster Avenue location, but I had never been there until a Sunday afternoon in March. 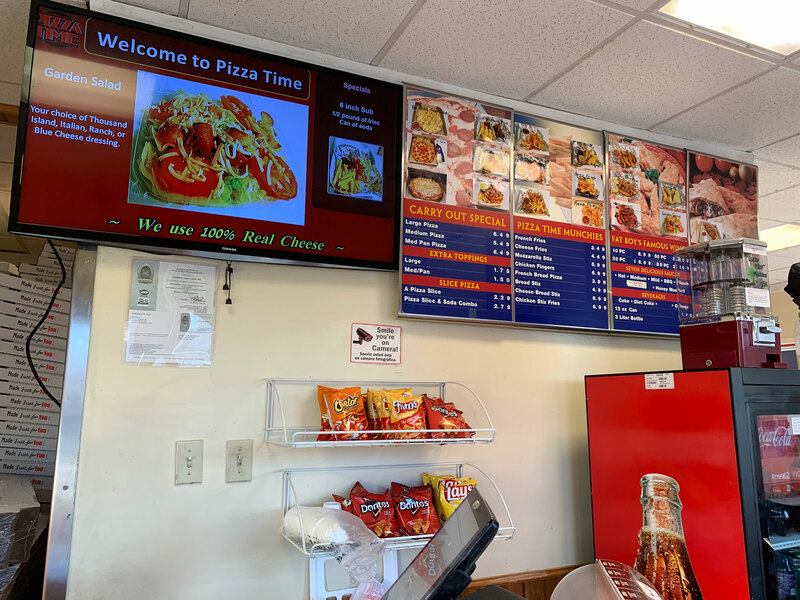 I browsed the menu online – pizza, sandwiches, “Fat Boy” wings, Stromboli and munchies – and was excited to be able to place an order through the website. It was a really easy process and there were several opportunities to customize my pizza, from a well-done crust to the number of slices. The order was also available for delivery or pick-up. With Pizza Time being just five minutes away, I made the quick trip to the restaurant to pick it up and check out the restaurant. The restaurant was smaller than I had expected. There wasn’t much space between the front door and the counter. And though it is advertised as “delivery, take-out or dine-in” there were only a couple booths if you wanted to eat in the small dining area decorated in Philly sports memorabilia. It had been just a little more than 10 minutes since I placed my order, but both my pizza and fries were ready to go when I arrived and I was back home a short time later. Pizza Time offers two sizes of pizza: a medium 12-inch and large 14-inch. For the medium pies, customers can choose between traditional and pan pizza. We chose a pan pizza with pepperoni. It was still hot when I got home and we took our first bites. The first thing we noticed was the crust. It was soft and spongy but not undercooked. It gave the pizza a different feel that we both enjoyed. 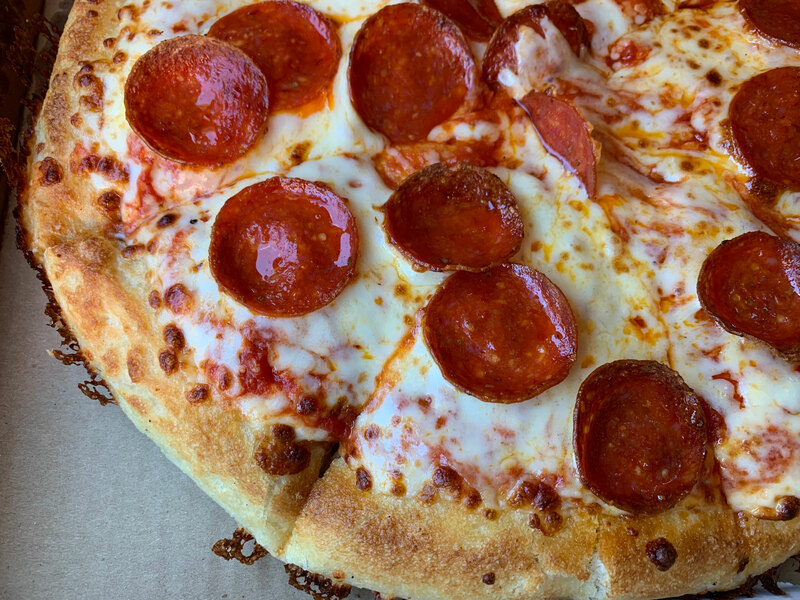 The toppings – the cheese, sauce and pepperoni – were all good. None of them stood out, but I thought they all worked well with each other to make a very solid pie. I also appreciated the addition of the cup of garlic butter for dipping the crust. We also ordered fries just to have a little something extra on the side. They were battered, crispy and golden. It’s probably my favorite style of fries. 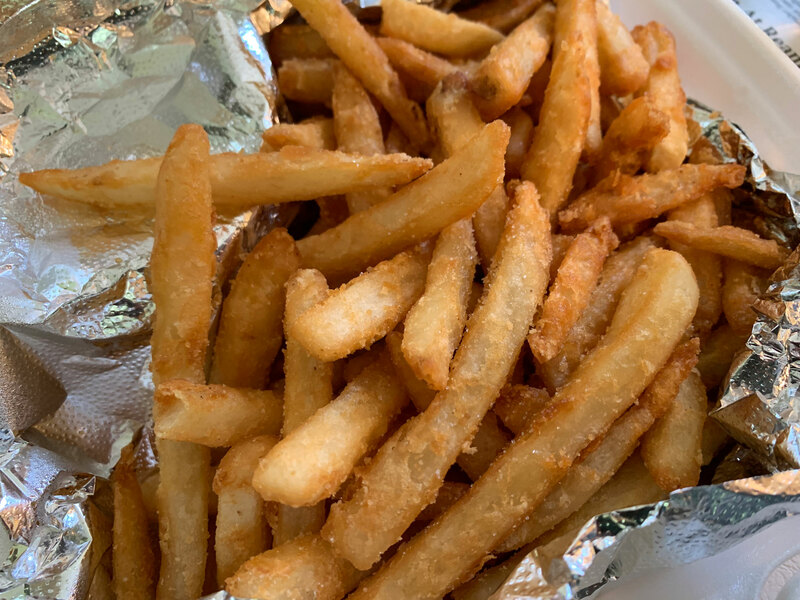 Julie noticed from her first bite that they were salty – maybe a little overly salty – but that was just one fry. The rest of the one-pound order wasn’t salty at all. In any case, it’s hard to find fault in a $16 meal that was ready in 10 minutes. 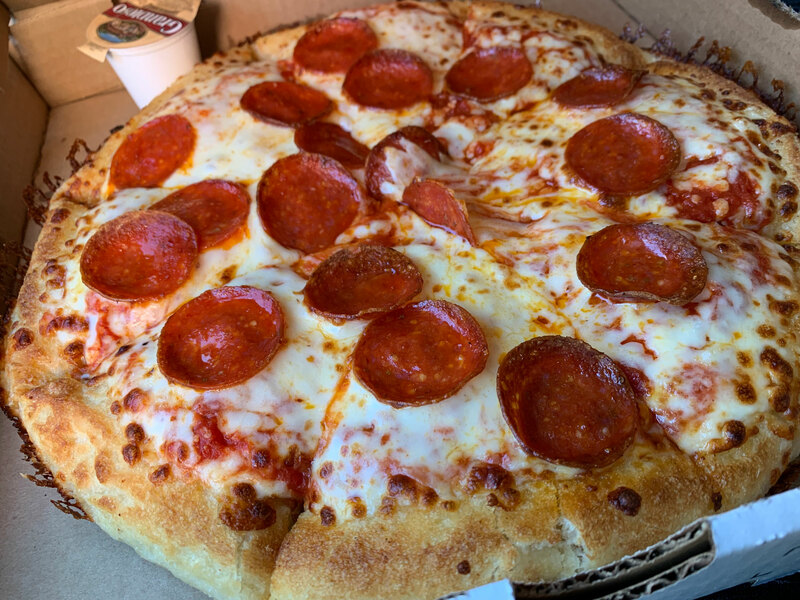 It’s been so long since I have had Pizza Time that I can’t say how it compares to all those years ago, but it was a good meal that was very convenient. That’s the hallmark of a long-lasting pizza shop.